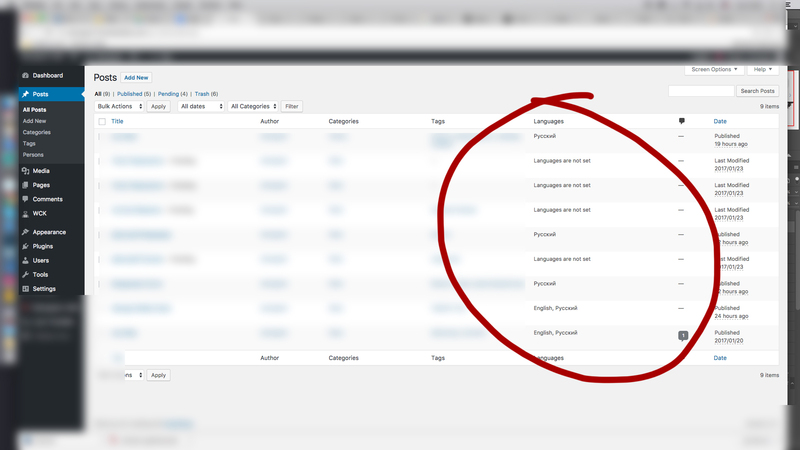 I use qTranslate-X plugin and I need languages availability to be displayed on the Blog page for each post. I have 4 languages (german, czech, english, french), so when i have english post with german translation, I need to show that there is no translation in czech and french, and that english and german are ok.
For example I select czech language for the site and I see only posts that have czech translation on the blog page. I have post with czech and english translation, czech and german translation, english and german translation etc. Each post have title and content, and I need only text message at the bottom of each post that this post also available on german, and unavailable on english and french. And Czech language in the example doesn't show because I select czech language. If i select german language so I need to display that post available in czech and unavailable on english and french. Yes, didn't manage to improve my answer before your comment. Please try with the new code and let me know what errors you get if any this time. Hi, many thanks for your feedback. Those are all jquery related errors. Probably a js script is not loading. What do you mean you only have header on the page? No get_footer(), no wp loop? Which wp template are you on? That mean that I see only header of the site after I add your code. Can we test your code somewhere on your test wordpress? Possible to send me login info to test?